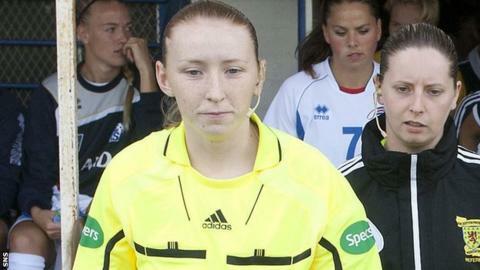 Kylie McMullan will this weekend become the first female assistant referee to take the field at a Scottish Premiership match. McMullan will be one of the assistants in Saturday's match between St Mirren and Hearts in Paisley. She has previously run the line in Championship matches and a Women's Champions League quarter-final. "When I found out about the appointment I was absolutely delighted," McMullan told the Scottish FA website. "I was promoted in January, so I've been working hard since then to prepare for this level. "For the match I'll prepare as I would for any other game, but I'll be a bit more nervous! Once the first whistle is blown on Saturday though I'm sure it'll feel like any other game." On the international stage McMullan, who is a policewoman, has worked as an assistant referee at two Women's World Cup matches. "Kylie's appointment is based on her performance over the past few seasons, and is a justifiable reward having graduated through the same pathway as all male officials," added head of referee operations John Fleming. "Not only has she performed at an exceptionally high level within domestic football, her experience internationally in the Women's Champions League and the Fifa Women's World Cup means that she is more than qualified for this Saturday's Premiership appointment. "Kylie is a role model for all female officials who wish to aspire to officiate the highest level." Hearts' visit to St Mirren Park will be the final match of the season for both sides.